A waterway can be classed as any channel in which water moves through the landscape. Waterways include natural creeks or streams and shallow or deep drains. The Torbay Catchment has an extensive network of over 350 kilometres of waterways that provide a variety of functions. These range in size from winter flowing swales to the large drains, which are managed by the Water Corporation. 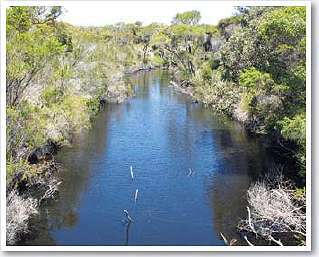 The main waterways are: Marbellup brook, Five Mile Creek, Seven Mile Creek, Torbay Main Drain (includes Unndiup Creek), Cuthbert Drain, North Creek Drain and Grasmere Drain. In the upper catchment these waterways are mostly natural creeklines, however some of these have been modified to increase their drainage capacity. The flatter lower catchment is dominated by drains or highly modified natural waterways. What role do waterways have? Economic: The introduction of the drainage system in Torbay developed the local agricultural economy. It encouraged new industries (horticulture) and expanded the grazing industry by permitting access to land during times that would have previously been too wet. Agricultural: Water is accessed from waterways for stock watering and irrigation purposes. Recreation: Canoeing, fishing, swimming and other passive recreation. Environmental: Waterways provide a habitat for a wide range of birds and animals, both terrestrial and aquatic. They also provide a natural corridor for the movement of wildlife through the landscape. Healthy waterways also help filter the water that passes through them, helping improve the health of receiving water bodies. Whose responsibility is it to manage waterways? Waterways management is a complex issue and responsibility may be shared among different groups and individuals. Management of most drains and creeks on private property remain with the landowner, giving them certain rights and responsibilities. For example a landowner may have a right to use water from the waterway, but the volume may be restricted to ensure it does not affect downstream users. landowners also have a responsibility to ensure that their activities do not have a negative impact on vegetation, bank stability or water quality. Many of the catchment drains are managed by the Water Corporation (WC) as part of the Albany Drainage District. While the drains are managed by the WC they often pass through private property. In these cases the landowner has a responsibility to ensure their activities do not damage the drain, while the WC has a responsibility to control declared weeds in the reserve and maintain water flow in the drain. The Department of Water is the State Government lead agency for water and waterway management. The Marbellup brook, identified as a potential drinking water source, has an additional level of management and protection from the Department not given to other waterways in the catchment. The Department of Water also shares the implementation of the Torbay Catchment Restoration Plan with the Torbay Catchment Group (TCG). The TCG works with landowners to help them manage their waterways and improve nutrient management practices. Some waterways, most notably parts of Marbellup Brook, flow through Department of Environment and Conservation (DEC) reserves, in which case management lies with the DEC.
Stock exclusion is the number one priority for waterway management in the Torbay catchment. Stock damage vegetation, destabilise the banks and their excrement adds nutrients and pathogens to the water. All natural waterways and drains larger than a spoon drain should ideally be fenced to exclude stock. The location of the fence should be set back from the main channel to provide an adequate buffer for riparian vegetation, water movement, nutrient and sediment control. Deciding the most appropriate vegetation for your waterway buffer will depend on what you wish to achieve and your capacity to manage the different buffer types. Three examples of buffer types are given below. However, you may wish to combine features of all to best meet your needs. Grassed buffers: A dense cover of perennial grasses, or other low vegetation 10-15cm high, can be very effective in slowing water and providing bank stability. For farmers they also offer the opportunity to provide feed by strip grazing in summer. However, grass buffers can be a weed risk for waterways and wetlands and they provide little in the way of biodiversity or shelter for stock. Natural buffers: A buffer can also provide biodiversity benefits by mimicking a natural waterway. It is important to provide bank stability through planting appropriate sedge and shrub species. by planting a range of species native to the area and incorporating logs and other objects to provide habitat variation you will have a healthier waterway that reduces erosion, provides habitat for wildlife and provides a windbreak for stock and pasture. Surface roughness can be improved through dense plantings that incorporate ground covers and allowing the build up of leaf litter. Through correct plant selection and bank slope, land managers can avoid slowing water flow more than is desirable, but enough to reduce erosion. Creating these buffers does take more effort to plan and establish than a grass or tree buffer but despite these challenges they provide maximum benefits for the environment and water quality. Therefore land managers should consider this type of buffer for all waterways. Shelter belt buffers: This type of buffer usually consists of several rows of trees alongside the waterway, which provide shade and shelter for stock and provide a limited bank stabilisation and nutrient stripping role. If grasses are incorporated to the buffer, further nutrient and sediment control will be achieved. They are easy to establish and because the vegetation type is more uniform and weed control is easier. you may wish to incorporate an agroforestry enterprise in this situation. However, the ability of the buffer to strip nutrients may not be as good as the buffers described above, as the surface roughness and density of plants is greatly reduced. Watering stock – best practice in Torbay. Waterways are often used as a place for stock to drink. The damage done to banks and water quality by cows accessing this water is a serious problem, though one that can easily be overcome. Off-creek watering points using troughs, soaks or dams should be used where possible. In some cases, fenced and paved creek access points or crossings may be suitable. The Torbay Catchment Group can help with designing and financing alternate watering points as part of waterway fencing projects. Crossings – why did the cow cross the creek? Having to cross a waterway is an inevitable part of a Torbay cows life, so building a suitable crossing is usually an important part of waterway management projects. Crossings should be built to minimise their effect on water flow, so understanding how your waterway works is the first place to start. The Department of Water’s book ‘Crossing Creeks’ is an excellent resource for this purpose. How wide should my buffer be? Most people want to know how far back from the main channel fences should go. As each waterway is different there are no set measurements. For erosion control (and to protect your fence) all fences should be above the flood level and include meander bends in the buffer (insert image). You should also consider what you wish to achieve – is it habitat creation, reducing recharge or water logging, nutrient or pathogen management (this should be combined with fertiliser and pasture management), stock control or a mixture of these elements. Water Corporation or other large drain: 5m access track plus 5-10m for mixed vegetation on one side and then a 10-15m vegetated buffer on other side (preferably the more north facing side). Medium – large waterways: 10 -15m vegetated buffer each side. Small creek or drain: 7-10m (or minimum three rows vegetation) each side. Spoon or W drains: 5 -10m grass buffer on each side. Buffers along Water Corporation drains must include a maintenance corridor (this is usually seen on the properties title deed and is actually Crown land). This corridor should be at least 5m wide from the bank crest. Grass, sedges or low herbaceous plants can be planted along this section. All works along these drains should be carried out in consultation with the Water Corporation. Having gently sloping banks rather than vertical banks. Using a series of wide and shallow drains, such as W drains, which can be completely planted with grass. Slowing the water to a rate which still performs the drainage function but does not have the velocity to cause erosion. The use of meanders, riffles, correctly placed wood and vegetation can be used to slow the water. Where a smaller drain enters a larger drain, designing the output to protect the receiving drain from erosion. Sediment entering or moving through the drainage system is serious problem. It reduces the capacity of the drain, requires expensive and time consuming maintenance and transports nutrients. Sedimentation also reduces the ecological value of the waterway, especially in filling in summer pools, which are a refuge for many animals. While erosion control measures at a whole of waterway scale is the best way to manage sediment, the nature of the drainage system and the land uses it serves means some sedimentation will be inevitable. Therefore, the use of sediment traps may be appropriate in some circumstances. Sediment traps are, at their most basic, an excavation in the drain which allows water flow to be reduced and thus dropping out sediment in a place where it can be easily removed. The size and design of these traps will vary depending on their location in the drainage system and the size of the drain they are on. The Water Corporation and Department of Agriculture and Food may be able to provide technical assistance with these types of engineering works. The Torbay Catchment Restoration Plan aims to reduce the amount of waterway erosion and soil erosion through the use of perennial pastures and using the techniques described in these guidelines. However, until this soil protection is more comprehensive across the catchment many farmers may still wish to regularly clear drains of sediment slugs to allow them to drain more effectively. When cleaning drains it important to protect the banks and any vegetation, ideally machinery should only touch the slug itself. Remember bank vegetation will help reduce future erosion and thus the need to remove sediment. If there is no or little vegetation present the cleaning of drains presents a good opportunity to slope banks back for erosion control and future planting. When drains are cleaned out, the spoil is often left next to the drain to form a bund. Unfortunately this material can cause a number of problems over time. In some situations the bund can erode, or the nutrients contained in it leach out, re-entering the drain. It can also impede surface flow from the land adjacent to the drain. Spoil piles from larger drains can also cause problems for future access and revegetation. The spoil can prevent access to the drain or vehicle movement along it, and the shape of the bund limits the ability to plant windbreaks or other vegetation along it. The uneven soil types in the bund can also stunt plant growth. Sediment removed from drains should be spread thinly along the ground to prevent the build up of bunds over time. Transport it away from the drain edge. Use W drains so spoil is in the middle. Historically farmers and drainage engineers have viewed logs as a nuisance that interfere with water movement and cause erosion. We now know that this is not the case. Strategically placed logs, when combined with native bank vegetation, can have a positive effect on bank stability while being great for habitat and even soil health. All without seriously interfering with flow. So don’t remove and burn those logs… keep them for your revegetation project. by Luke Pen (1999) Water and Rivers Commission. The definitive guide to Western Australian rivers and their management. A book published by the Department of Water. Water Corporation – for issues relating to drains.